Justin Auger scored twice and Kevin Gravel buried the game-winning goal to help the Ontario Reign (18-8-2-1) edge the Texas Stars (17-14-3-3), 3-2, on Tuesday night at Citizens Business Bank Arena. Auger finished the night with three points, tallying an assist on the Gravel goal. 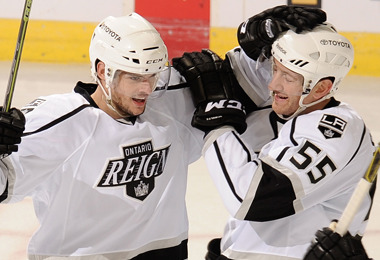 With the win, the Reign snap a three-game losing streak. After a scoreless first period, Auger buried a shot past netminder John Muse on the power play unassisted at 10:28. The Reign started the final frame with a successful penalty kill after forward Ryan Horvat was called for roughing at the end of the second period. With the Stars’ pressure increasing around the net, Auger skated through the left circle and hammered a shot over the glove of Muse at 7:06 for his eighth goal of the season. Texas got on the board at 11:39 to trim the Ontario lead 2-1. Brett Ritchie scored on the give-and-go from Brendan Ranford and Ludwig Bystrom. With just under six minutes to play, the Stars evened the contest. Defenseman Matt Mangene fed the puck to forward Jason Dickinson who tucked it past goaltender Peter Budaj. Both teams pressured until the final seconds, but time expired, sending the game to extra minutes. A little over 90 seconds into overtime, Auger fed a pass to a wide open Gravel who fired the puck past Muse, clinching the Reign’s 3-2 win. Budaj earned his 17th victory with 23 saves, while Muse stopped 30 shots.